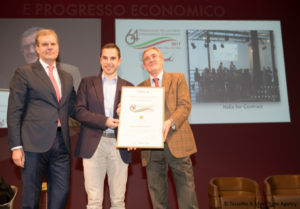 On Wednesday, November 29, “Italia For Contract” network received the 64th Award for Work and Economic Progress. The jury of the Chamber of Commerce of Udine decided to confer the “Business Network” award to Italia For Contract, as a commendable model. Each company of the network represents an excellence in its own sector boasting important projects in international markets and prestigious collaboration with the most renown architectural and planning firms. Trusting the companies of the network Italia For Contract means choosing partners with proven tracking record to manage each proposed project with skill and seriousness.From airport spaces to big cruise ships, from prestigious theatres to luxury hotels, the companies of the Italia For Contract network are able to propose products to their customers exalting the blending of innovative original design and tailor-made production.